Delicious Drip: We Don’t Want Your Body. | Pulp and Circumstance, Juiced. Delicious Drip: We Don’t Want Your Body. 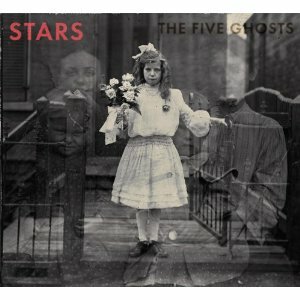 The loverly Stars are releasing a brand new record this summer, The Five Ghosts. And let humble blogger be the first to tell you, it’s a pretty starry sky out there my friends, because this one is a constellation of delicious indie pop. Yep, I said it. I went there. Regardless of my horrible metaphor, Stars fifth studio record features return production work from Tom McFall, who was the brilliant mastermind behind 2005’s Set Yourself on Fire; so if you ever were a fan of that, be sure, you’ll be a fan of this. The Five Ghosts is filled with deep, heavy synth and pulsation set behind a backdround of drowningly dark, albeit cloudy skies–much like its, at times, muddy production. Of course, its filled with tragedy and mayham and heartbreak, so obviously it’s everything you’d want to prepare for battle; it’ll pump you up through the beat and bring you down with its lyrics; and it will certainly get your ready for the duel with, of course, the stamped as Stars vocal battle betwixt Torquil Campbell and Amy Millan. If you don’t like your record a bit mixed up, maybe this isn’t for you; however, there’s something so satisfying, always, in Stars, thanks to the breathyness and welp, downright depressive kind of attitude. The Five Ghosts drops tomorrow. Gobble the first single below. This entry was posted in Delicious Drip, jwolf and tagged stars. Bookmark the permalink.